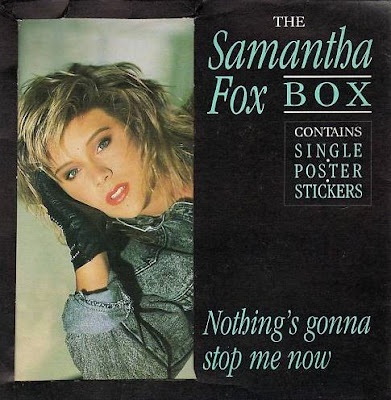 SAMANTHA FOX Italia: Step back in time: 27 years of "Nothing's Gonna Stop Me Now"
Step back in time: 27 years of "Nothing's Gonna Stop Me Now"
Samantha Fox's first single off her self-titled second album entered the UK singles chart 30th May 1987. The song "Nothing's Gonna Stop Me Now", written and produced by Stock, Aitken and Waterman stormed the European charts and reached #1 in Finland, #2 in Italy, Switzerland and Norway. It reached #8 in the UK, staying in the chart for 9 weeks. Sam re-recorded the song with producers Pete Hammond, Carl M. Cox and Nathan Thomas to be included in her 2009 "Greatest Hits" compilation, but it still remains unreleased as yet. INDIETRO NEL TEMPO: 27 ANNI DI "NOTHING'S GONNA STOP ME NOW"
Il primo singolo dal secondo omonimo album di Samantha Fox entrò 27 anni fa nella classifica dei singoli più venduti in Inghilterra. Il brano "Nothing's Gonna Stop Me Now", scritto e prodotto dal trio di produttori Stock, Aitken e Waterman, fu un grande successo in Europa, raggiungendo la prima posizione nelle vendite in Finlandia e il numero 2 in Italia, Svezia e Norvegia. In Inghilterra arrivò al numero 8 e restò in classifica per nove settimane. Samantha registrò una nuova versione insieme ai produttori inglesi Pete Hammond, Carl M. Cox e Nathan Thomas per includerla nel suo "Greatest Hits" del 2009, ma non venne mai pubblicata ed è ad oggi ancora inedita.